Layers of psychological awareness betray unassuming audiences of “Rear Window,” and most are not easily disregarded by its three observant main characters either. There is a disquieting resonance in what their eyes and ears absorb; from an apartment window overlooking a closed courtyard containing numerous dwellings, the busy lives of an assemblage of suburban tenants are seen in full disclosure, as if participants in an intricate stage play of wordless drama. Some events converge as neighbors interact in passing, while others simply occupy space in peripheral subplots. They are the kinds of people that do not concern themselves with hiding behind shades or curtains, but does that create a right in others to observe so closely? If some such lives are absorbed by fatal circumstances, is this notion of snooping then justified? The questions become even more vital once the tone is set by a sardonic massage therapist, who makes a pointed observation in an early scene of the film that seems to reveal the essence of our collective modern standard: “We’ve become a race of peeping toms,” she concedes. Irony overwhelms this connotation. Beneath pointed dialogue, perceptive character development and plot twists that propel conflicts into a fevered pitch of tension, the movie plays like a breakpoint in our journey towards complete voyeurism. Alfred Hitchcock sensed this perhaps not as accidentally as most would assume, but his precision is almost clairvoyant – especially in context with our world of today, when the idea of privacy is a forgotten relic in the age of Google and social networking. The characters of “Rear Window,” arguably his greatest film, are primitive archetypes in this distinction, but many of them stand within the action like their safe world of discretion is quietly crumbling around them. 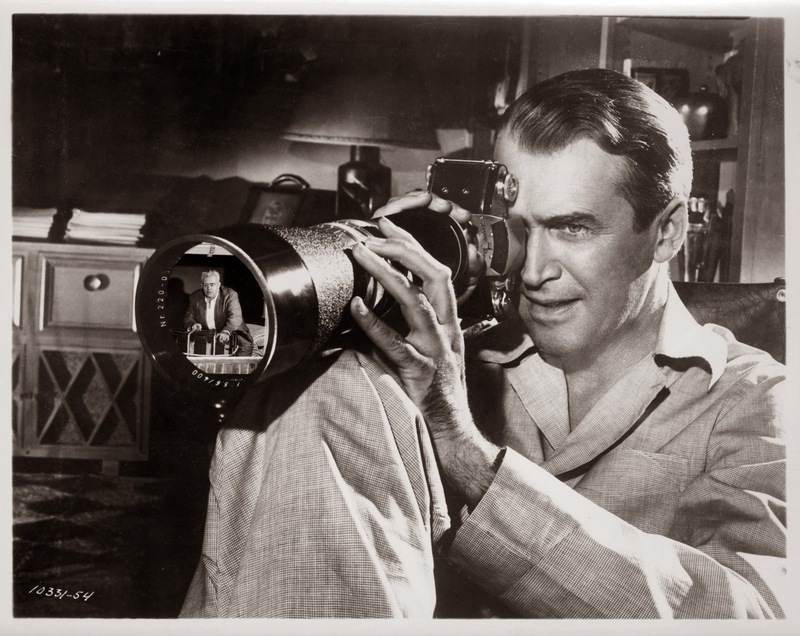 And always there is Jimmy Stewart’s audaciously observant Jeff, peering down in perplexed fascination at what he sees, using the lens of a camera as his defense against traumatic details. That, in many ways, makes him more Hitchcock’s avatar than just a mere character in a movie. The premise echoes the greatest of the director’s simple but lucrative narrative launching points. Jeff (Stewart) is a wise and observant photographer who has spent several weeks in isolation, as a result of a broken leg that has lowered him to a wheelchair in his towering New York apartment. The heat of an unforgiving summer creates underlying discomfort, and social interactions are limited to two figures: his sarcastic massage therapist Stella (Thelma Ritter), and a romantic interest with a ravishing style and resounding patience (the marvelous Grace Kelly). The routine, meanwhile, relegates him to a basic grind: eat, sleep, get daily massages, banter with his visitors, and then frequently spy on the day-to-day routines of his neighbors, all of whom sit beneath his abode as if to suggest he exerts power over their meek little lives. Perhaps, as a news photographer, that’s exactly what he desires: to tower over the events he witnesses with almost ghoulish displacement, like a snoop with a camera hidden safely behind shadows. His observations play like a succession of images that gradually evolve into fascinating stories. Some subjects are given pointed nicknames, like “Miss Torso,” a young woman who practices ballet in the apartment directly across Jeff’s while only wearing her underwear, and “Miss Lonelyhearts,” a spinster in the downstairs apartment that goes to elaborate lengths to doll up for ill-fated dates with men. A menagerie of others fill in the courtyard too, including an aspiring songwriter always looking frustrated in solitude at his piano, and a newlywed couple that appears in the window frame only between romantic interludes. Another couple across the courtyard finds better comfort in sleeping on their mattress at night on the outside patio, and their nearest neighbors, another couple, don’t emerge from the nest often enough to leave behind any impressions on others. This, of course, is intended; in scenes where heated arguments and angry gestures are exchanged like mere breaths, it is obvious to the curious photographer – and us –that a potentially deadly story is developing on the other side of their windows. What occurs in that apartment over the course of the movie’s running time is a dynamic display almost tailor-made for movie cameras. 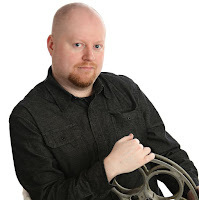 The talented cinematographer Robert Burks, who shot ten of the director’s films, was precise in the way he caught sight of all these characters from a point of clarity (all the key scenes occur within Jeff’s apartment), and the courtyard they reside in – the biggest set ever to be built at the time on the Paramount lot – produces that bizarre quality of seeming endless and yet claustrophobic all at once. The best sequence correlating to the central conflict is indicative of the impeccable sense of pacing Hitchcock possessed: during a particularly humid night while Jeff drifts in and out of slumber, the foreboding figures across the yard are heard and seen in lightning-fast increments. There is a bloodcurdling scream. Then silence. The husband leaves the apartment in the dead of night, seemingly shaken. Then he returns much later, unattended. By the following morning the wife is no longer seen from Jeff’s vantage point, but where did she go? Is it possible he slept through a key moment in which she fled the apartment apart from her enigmatic husband? All of these details exist with obligatory uncertainty, because they are devices used to undermine the protagonist’s doubt so drastically as to enforce his nature to snoop, dig and shamelessly intrude. Audiences do not second-guess these antics, because to them, this is all already part of the fabric of their overexposed culture. In revealing this reality, “Rear Window” reaches much deeper into that material than any of Hitchcock’s other great films. Movies that have a dual function as a prophecy are the rarest of endeavors, because they require a filmmaker farsighted enough to make astute predictions. Most of them are merely accidents that erupt from satire, like Mike Judge’s “Office Space” or Sidney Lumet’s “Network”; even rarer among them are those where filmmakers appear to be looking through some proverbial crystal ball, and channeling its images into frames of celluloid with startling cognizance. Later films both in and out of the Hollywood system would build on this facet with much darker intentions, including Michael Powell’s disturbing “Peeping Tom,” about a killer whose camera captures a person’s last horrific moments at the center of a lens. The common bond, at least to us, is that the best movie artists of the distant past saw their medium not just as forums for entertainment, but also for warnings against the disquieting trends of society. In Alfred’s case, though, here was a tendency moving too fast to neutralize, especially with the spread of suburbs. The screenplay by John Michael Hayes, another frequent collaborator of Hitchcock’s, is an insightful marriage of character and behavior, and the dialogue is used to accentuate details rather than absorb them into elaborate euphemisms. Notice also how the three lead actors – Stewart, Kelly and Ritter – play the material with straight conviction, as if unaware of the monumental profundity stirring beneath them. Stewart, who starred in four films with the master of suspense, was probably used to this after the brilliant “Rope,” and would no doubt experience similar feelings after “Vertigo.” Kelly, on the other hand, evokes her own energy; she doesn’t necessarily appear to be in synch with what her director intends with his endeavors, but shines vividly and passionately through material that seems foreign, and when the plot demands her presence at the center of a very tense sequence towards the climax, we grind our teeth in horror just as harshly as her wheelchair-bound companion does. What inspired the master of suspense to find almost a sadistic pleasure in meddling in the questionable private lives of others in the majority of his films? This is a movie that answers that, I suspect, with autobiographical accuracy; just as his hero Jeff is a man on the hunt for shocking moments worth catching in the paralysis of photographs, Alfred was the architect of filmic exposure, using his movies as a gateway in discovering questionable faces: the shady, the corrupt, the psychological tortured and the criminally insane, sometimes within the same stories. The consensus remains that “Vertigo” is his unchallenged masterpiece, and it’s not hard to see why: many of those facets congregate in one of the most powerful movie narratives of its time. But “Rear Window” has an infectious and savage charm that leaps beyond even the highest of expectations. It is wonderfully entertaining. What’s more, it is also a vivid reminder of who Hitchcock was and continues to be: the quintessential voice of audacity in an industry starved for the guidance of progressive voices.